Manor Cottage, Main Street, Follifoot - �850,000 with Verity Frearson, 01423 562531. Follifoot, which is two miles south of Harrogate, belongs to a small band of places that remain closely connected to their origins. Its Norse-derived name means “place of the horse fight” (a popular pastime among the Vikings who settled here) and although that particular sport died out in the Middle Ages, horses still feature prominently in local life. 5 Manor Fold, Follifoot - �415,000 with Beadnall Copley, 01423 503500. The village lent its name, in modified form (Follyfoot), to a 1970s TV drama series about a rest home for horses, and even today, one of its most prominent businesses is Follifoot Park Riding Centre, which is also home to the Follifoot Park Disabled Riders’ Group. Follifoot lies at the confluence of Horse Pond Beck and the Lolburn, which used to run down the side of the main street, but now flows beneath it. The village is dotted with reminders of different periods of its history: the ninth-century Anglo-Saxon cross, the 17th-century stocks and animal pound, and the 19th-century south gatehouse to the Rudding Park estate. The 2,000-acre estate, with its grade I-listed Regency-style country house, hotel, spa, golf course and holiday park, remains an imposing, if benign, presence, and at the very least prevents any further development on the village’s northern edge. Stable Cottage, Manor Court, Follifoot - $575,000 with Dacre, Son & Hartley, 01423 877200. For all its historical wealth, though, the village is still very much a going concern. It has a shop, post office, two pubs, sports clubs, village hall and church, as well as enough post-war housing to prevent it becoming a moribund museum piece. Vitally, it has also kept its primary school, which was rated Good following its last Ofsted inspection in 2016. In the heart of the village, Manor Cottage is believed to date from 1681 and was converted into a single home from two cottages in 2008, when the property was modernised with new electrics, central heating, windows and doors; a new roof was added in 2015. On the ground floor there is an open-plan dining kitchen, two reception rooms, cloakroom and utility, and upstairs there are four double bedrooms, two of which have en-suite shower rooms, and a house bathroom. 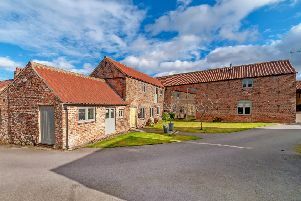 There’s off-street parking for up to three vehicles, plus a large detached garage, and to the rear there is a large walled courtyard garden and a separate small grassed area at the rear of the garage. Slightly closer to the top end of the village, Stable Cottage is a barn conversion that used to be a part of Manor Farm before it was converted some 20 years ago. It has four double bedrooms, three reception rooms and two bath/shower rooms (one en suite), as well as a sitting room that opens in to a conservatory, with an adjacent dining room and separate study. Outside, there are courtyard gardens and a double garage. Within the same development, 5 Manor Fold is a stone-built mews-style house with three bedrooms, two bathrooms, entrance hall, kitchen, two reception rooms, utility room, study, an integral garage and front and back gardens. It should be noted that the garden room, gardener’s WC, utility and some or all of the garage could be reconfigured to create a home office, treatment room or self-contained annexe for a relative.